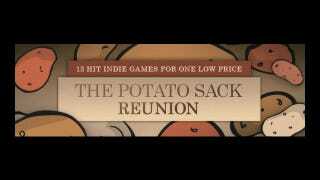 Last year, Valve released a bundle of indie titles on Steam called the Potato Sack. It was a great deal, sure, but another main purpose was for it to set off a chain of marketing and hype that led to the early release of Portal 2. This year, the idea returns, with the Potato Sack Reunion. For USD$20, you'll get 13 of the best indie games available on Steam, including Audiosurf, Amnesia, Defence Grid, The Ball, Super Meat Boy and BIT.TRIP.BEAT. If you're thinking "that's the same offering as last time", you're right. That's why this is a reunion. As a bundle, it's a nice idea. As a possible launching pad for another round of Valve conspiracy madness, it's devastating in its implications. My advice? Sit this one out. Your heart won't take the strain.